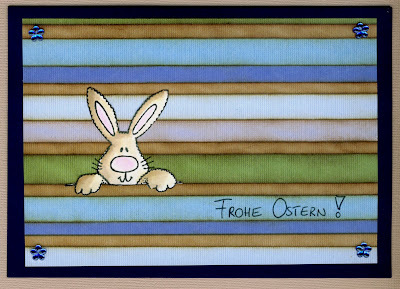 When I saw this peeking bunny, I had immediately the idea of letting him look through some striped paper... The dp is by All My Memories, the bunny stamp by Inky Antics. Sentiment handwritten. I'm a Scrapadile DT member! I was spied by Your Next Stamp! This is my private weblog on which I share my crafting and stamping projects. I don't sell my hand-crafted items. The copyright for the materials I use is owned by the companies producing them. I try to give credit for all the products I use. If any credit given might be wrong, please let me know, and I'll correct the information asap. To copy, spread or re-use my photos, blog posts or parts of them needs my explicit permission. If any of my blog posts should harm the copyright of someone else, please let me know, and I'll remove it immediately. I'm not responsible for any of the contents on pages I'm linking to. The contents on those pages don't represent necessarily my personal opinion.